The Lancaster JetHawks are proud to announce they will be hosting their Third Annual Hot Stove Banquet on Thursday January 31st, 2019. 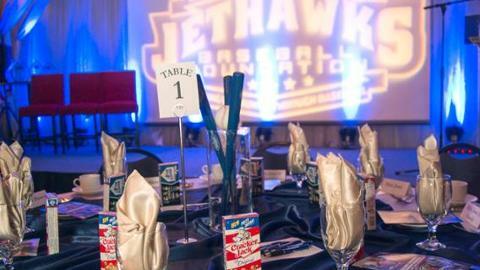 The Hot Stove benefits the JetHawks Baseball Foundation, presented by Learn 4 Life. This evening event will be held at the University of Antelope Valley Ballroom. In the coming weeks we will be releasing more information on time, speakers, auction prizes and more. Last year's event was completely sold out. Do not miss your chance to attend this fantastic event that will feature great food and a night of fun benefiting the JetHawks Baseball Foundation and the youth of the Antelope Valley. Order your tickets today by calling 661-726-5400, or stopping by the stadium offices at 45166 Valley Central Way, Lancaster, CA. Since its inception in 2017, the JetHawks Baseball Foundation has provided more than 240 children in the Antelope Valley with the opportunity to learn baseball and vital life skills at The Hangar. Through the support of our sponsors and donors, the JetHawks Baseball Foundation provides bats, gloves, shirts, hats, and experiences that will last a lifetime for each child who participated, all at no charge to them or their families. For all the information on this year's Hot Stove Banquet, click here.